As Sri Lanka’s Preparations and count down for under -19 World Cup commence, all eyes will focus on promising off spinner Raveen Sayer not so much for the right reasons but for the wrong reasons. The former Trinity College Captain who finished with 96 wickets last season and 108 wickets in the previous season has been included in the potential 20 member World Cup Squad for the Pakistan tour which commences today. However as most wicket taking off spinners are experiencing today, Sayer’s action was also reported by local umpires as Suspect and since then has undergone remedial measures under the guidance of his School Coach Sampath Perera. Perera who has proved his credentials as one of the best Cricket Coaches today worked tirelessly for days and weeks with Sayer to re-model his action. Sayer returned to the side this year and has been amongst the wickets for his school leading Trinity to four wins in five games already in the current third term season. According to Coach Perera as a result of his re-modelled action Sayer has sacrificed turn but has managed to develop more variations in his bowling . “He now bowls the arm ball and the straight ball which has been very effective in addition to the regulation off break”, Coach Perera, said. However it will be interesting to see if Sayers re-modelled action will get the green light during the home Pakistan tour where top level Grade One umpires are expected to officiate. Speaking on grounds of anonymity a National Selector expressed doubts about the legality of the action. “It will be interesting to see his action how he performs during the tour we will be watching him very closely”. Since identifying suspect bowling action is very often difficult with the naked eye, The Sunday Times learns from reliable sources that Sayers action is to be videoed and closely scrutinised in order to ascertain the actual situation. 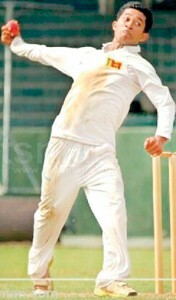 He has been named in the squad for the second three day game at Hambantota. The first three day game commences today. Sri Lanka has named a strong squad of 20 players for the two three day games which will be followed by five one day games, the first of which will be played in Hambantota and the next four in Colombo. The team is led by Richmondite Charith Asalanka with last year’s Ananda skipper Sammu Ashan as his deputy. The squad is believed to be packed with a host of genuine all rounders and is expected to be a front runner at next year’s world cup in Bangladesh. Following the tour of Pakistan, Sri Lanka will be joined by India and England in December for a triangular in Colombo.